Vincent (Bill Murray) doesn’t have much going for him in life. He lives alone. He drinks a lot. He gambles a lot. And he is broke. When newly divorced Maggie (Melissa McCarthy) moves in next door with her son Oliver (Jaeden Lieberher), she and Vincent get off on the wrong foot. After a particularly bad first day at his new school, Oliver is locked out of his house. Vincent reluctantly allows Oliver to come in to use the phone to call his mom. Needing the money, Vincent works out a deal with Maggie where he will babysit Oliver every day after school. While under Vincent’s care, Oliver meets a prostitute, bets on horse races, hangs out at bars, and helps Vincent pretend to be a doctor. He also learns about life. There is more to Vincent than what most can see. St. Vincent is marketed as a comedy. It stars the venerable Bill Murray and Melissa McCarthy. It has to be hilarious, right? Kinda. When it comes to casting, if you want your comedy to be good, putting Bill Murray in the lead role is one of the best places to start. The movie starts with some classic Murray slapstick. And there are moments of his comedic genius throughout the film. However, like Vincent, there is more than just what you see on the surface. Murray can take these funny moments and mix them with fantastic dramatic moments seamlessly. Melissa McCarthy was a pleasant surprise in this film. In so many movies, she plays the same over-the-top character. She’s funny. But it can get old. In St. Vincent, she tones it down. A lot. There are no manic screaming scenes. No overdone slapstick bits. Instead, she was a concerned mother trying to do what is best for her boy. It is a completely different side of McCarthy. And I, for one, enjoyed this side of her. Perhaps the most impressive performance has to go to Jaeden Lieberher. How many kids, being only 11-years-old, and in their first major movie role, can go toe to toe with Bill Murray and hold their own? St. Vincent is a drama first. The comedy comes second. That’s not to say it’s tacked on as an after-thought. The story is much deeper than you are lead to believe. Yes, it’s a story we’ve seen before. A grumpy old man is forced to spend time with a rambunctious kid. The kid and the old man learn about each other and we see what lies beneath the surface. What makes this film so successful is the way the story is told and the performances by the cast. 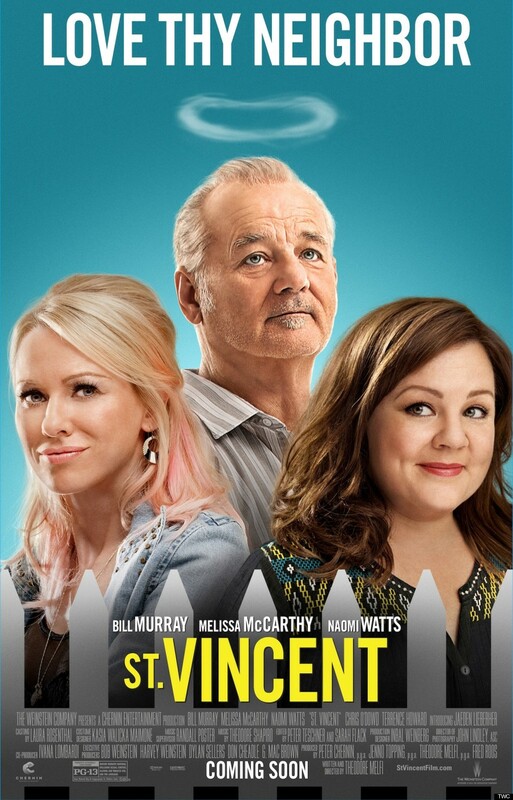 Don’t go into St. Vincent expecting a classic Bill Murray or Melissa McCarthy movie. You have to go into this movie expecting more. If you do, you won’t be disappointed.